The Commander is a modular, multi-purpose storage building with tremendous storage space and huge door opening large enough to store a small car or boat or to create an ideal workshop or small warehouse. Frame, wall, and roof parts are made from hot-dipped, electro-galvanized steel, and all painted parts have a double-baked-on enamel paint finish that will keep your building serviceable and attractive for years. Modular section design - easily add more space. 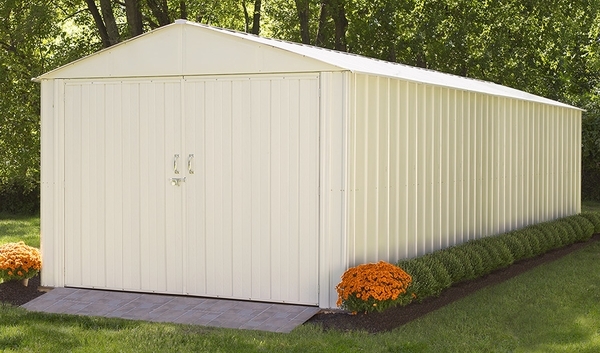 This 10' by 25' storage shed boasts 243.1 sq./ft of storage and features UV resistant HDG STEEL panels are 15% thicker than standard steel to protect against rot, insects, and extreme weather conditions.